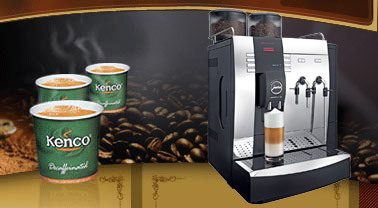 The Kenco K Bar bean to cup coffee vending machine uses the high quality Kenco range of In Cup products that includes a variety of Kenco coffees, PG Tips tea, Suchard chocolate, Knorr soup, Bovril, orange juice drink and Kenco Cappio. Up to 8 of these Kenco In Cup selections are available in this machine. It also allows for the dispense of large 9oz frothy coffee shop style drinks into a branded paper cup. The coffee options include latte, mocha, caf� au lait, espresso, americano and cappuccino. These are produced with freshly ground whole coffee beans to give you a fantastic quality of drink. Typically floor standing coffee vending machines dispense a 7oz measure, often into a plastic cup and with instant ingredients, making the K Bar bean to cup machine a significant improvement in quality when compared to other systems. The K Bar features a large sugar dispenser meaning that all of the drinks are available with or without sugar. The operation is completely automatic with all drinks being dispensed at the touch of a button. The Kenco K Bar can be set up as a purely free vend system or can be fitted with a change giving coin mechanism. There is even an automatic self-clean facility, although the machine will still require a certain amount of regular maintenance. The K Bar cannot be manually filled with water and as such must be plumbed into the mains water supply. This allows for the fitting of a commercial water filter that will help to minimise potential technical problems caused by hard water (a particular problem in London and the South East of England). The other obvious benefit to a good water filter is that it gives you a noticeably better quality of coffee. 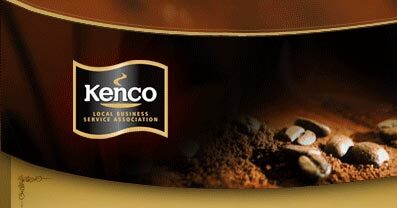 Kenco Local Business Service are the leading supplier of the K Bar bean to cup coffee vending machine across London, Buckinghamshire, Berkshire and Hertfordshire. This area takes in towns such as St Albans, Slough, Berkhamsted, Marlow and Hemel Hempstead. We can offer service support as well as quick and efficient supply of the products for this machine across the region. If you don�t want to fill the machine yourselves then we can even visit your premises to keep the machine stocked and cleaned for you. As with all of our equipment the K Bar is available on a rental, lease and purchase basis. 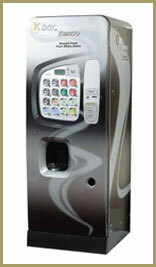 We often have refurbished coffee vending machines that we are prepared to free loan if the circumstances are right.